Participate online at //www.facebook.com/davisortho.ca. Contest closes March 30th, 2012 at 12 PM. There will be one (1) winner identified by Davis Orthodontics on April 2nd, 2012. Winner will be determined by the participant with the highest number of “LIKES.” In situations resulting in a tie, a winner will selected by draw. The winner will receive SOLO Beats by Dr. Dre Headphones. Videos posted are subject to inspection by Davis Orthodontics and may be removed without notification if deemed inappropriate or offensive. Davis Orthodontics reserves the right in its sole discretion to disqualify any individual it finds to be tampering with the entry process or the operation of the Contest or to be acting in violation of the Contest Rules or otherwise in a disruptive manner. Click on “Like” on Davis Orthodontics’s official Facebook page. To be eligible, participants must be a patient or parent of a patient at Davis Orthodontics. 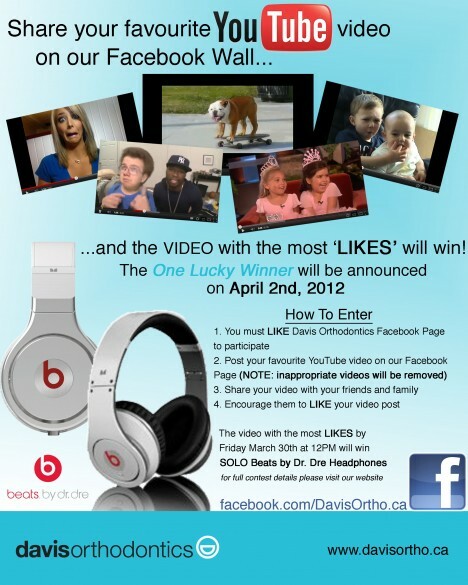 Participants must post their favourite YouTube video on the Davis Orthodontics Facebook Fan Page. Participants must encourage Facebook Friends and Family to “LIKE” their video post on the Davis Orthodontics Facebook Fan Page. Each time a participant may only post one (1) video. The winner will be notified by either phone, e-mail or private message on Facebook on April 2nd, 2012 upon being announced as the winner on the Davis Orthodontics Facebook Fan Page. Winners consent to the use of their name and/or photograph, on Davis Orthodontics Facebook Fan Page and Website. While Davis Orthodontics will be monitoring the contest in detail for the duration of the contest period, any oversights or errors on our part will be resolved through our sole discretion.